The Gnaraloo Turtle Conservation Program (GTCP) has commenced on-ground monitoring in the Gnaraloo Bay Rookery for the marine turtle nesting season 2014/15. Together with the Gnaraloo Feral Animal Control Program (GFACP), the GTCP aims to identify, monitor and protect coastal nesting rookeries of endangered marine turtles in Gnaraloo, a working pastoral station and wilderness tourism business located approximately 150 km north of Carnarvon in remote north-western Australia. Support has been provided to the Gnaraloo Station Trust by Rangelands NRM through funding from the Australian Government to actively reduce feral animal predation of turtle nests through the GFACP. 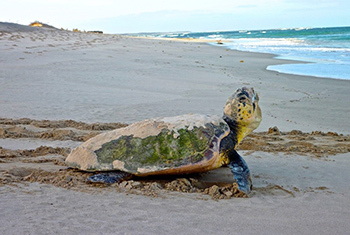 The GTCP works alongside Animal Pest Management Services (APMS) to conduct the GFACP, which strives to reduce the number of feral animals in the area and consequently eliminate feral animal predation on sea turtle nests. This season’s field team recently completed training in feral animal track identification, conducted by Mike Butcher of APMS. The training included identification of fox, wild dog, and feral cat tracks, as well as other frequently occurring animals in the area. The scientific research team will continue to monitor nesting beaches for feral animal activity, including predation and disturbance of turtle nests, and provide real-time feedback to APMS as part of the Monitoring Evaluation Reporting and Improvement (MERI) strategy between the GTCP and the GFACP. 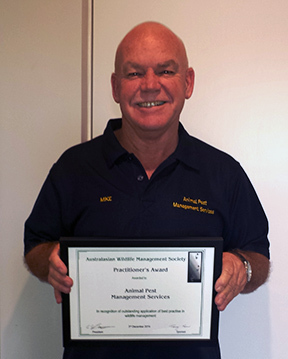 “The GFACP has been a great success since its inception in 2008, having achieved zero predation by feral animals on turtle eggs in the past four years,” boasts Mike. The program protected approximately 47,000 loggerhead turtle eggs last season (2013/14), with a running total of 188,000 loggerhead eggs since 2010. The GTCP also includes a strong community engagement program, which allows the field scientists to present their work to school students, professional bodies and other community groups. “Last season the program presented to 4,589 individuals in Western Australia and Victoria, plus a wider audience nationally and internationally that was reached through radio discussions, publications, and online media communication,” explains Project Manager Karen Hattingh. Gnaraloo welcomes all visitors to the area and strongly encourages community participation in the GTCP. The research team is able to provide information to schools and community groups, including presentations and excursions on-site at Gnaraloo Station (December 2014 – January 2015) as well as off-site at the end of the turtle nesting season (March ‘ April 2015). For more information on the GTCP and GFACP, please visit www.gnaraloo.com.au, or call +61 (0) 8 9942 5927. Gnaraloo is a particularly unique case for environmental and marine conservation projects, as it is both a wilderness tourism business and working pastoral station on the Ningaloo Coast, Western Australia (approximately 150 km north of Carnarvon). Gnaraloo abuts 65 km of pristine coastline within the Ningaloo Marine Park and Ningaloo Coast World Heritage Area. The Gnaraloo Bay Rookery is the largest confirmed mainland nesting rookery for endangered loggerhead sea turtles (Caretta caretta) in Western Australia, with consecutive full season surveys since 2008/09. The rookery is also used by endangered green turtles (Chelonia mydas) and critically endangered hawksbill turtles (Eretmochelys imbricata). The program operates within the Gnaraloo Bay Rookery and the Gnaraloo Cape Farquhar Rookery. Together these rookeries support and contribute to the third largest loggerhead sea turtle population in the world. The Gnaraloo Bay Rookery is considered a significant loggerhead nesting rookery as it is home to over 300 nests each season. The GTCP on-ground field team consists of five research scientists who remain at Gnaraloo from late October to the end of February each season. The research team conducts beach surveys every day during this time period, as well as night surveys for a select portion of the season. The program is headed by an experienced environmental scientist and Project Manager, Karen Hattingh, who is supported by a full-time onsite Program Assistant, Melissa Tan. The remaining four researchers are involved as part of a six month scientific internship program. The GTCP has recruited highly-skilled national and international scientific interns every season since its inception in 2008. The program trains young field scientists in turtle track identification, Species Identification, Nesting Activity Determination, feral animal track identification and overall scientific field skills.